Ever since the March 24 uprising against Vedanta Sterlite's copper smelter in Thoothukudi, corporate hitmen and spin-masters have sprung into action to defend Sterlite. In addition to the usual invocations about how the protests are backed by vested interests, foreign powers and the opposition party, Sterlite and its backers have deployed an age-old tactic used by those who generate, handle and emit toxic pollutants – namely, put the burden of proof on those harmed by the pollutants. The tobacco industry did this for decades asking victims to prove conclusively that their lung or throat cancers were caused by cigarette smoking. Asbestos manufacturers continue to successfully stave off international legislation on the carcinogenic fibre citing lack of scientific certainty. Dow Chemical and Union Carbide continue to deny that Methyl Isocyanate, the Bhopal gas, has anything to do with the lasting effects on the health of those exposed to the disastrous gas leak in 1984. Unilever wishes us to believe that mercury is not the cause of the high incidence of nervous disorders, memory loss, dental disorders and kidney failures among the workers at its thermometer factory in Kodaikanal. Decades after the heavy metal lead was identified as a major cause of impaired brain development among children, petroleum companies delayed legislation curbing the addition of lead to petroleum, arguing that the science was not conclusive. I can go on, but I will stop here. Sterlite and its apologists are part of a dubious tradition of deniers and reactionaries that have delayed action on the most pressing ecological issues – from acid rain, ozone hole, mass extinction to climate change and plastic pollution -- facing humankind. In the coming series, I will present evidence of harm to the environment and human health caused by Sterlite's operations. To do this, I will use data put out by Sterlite or other official data and studies commissioned by Sterlite, TNPCB or the Courts. Is there data to suggest Sterlite's operations may be harming health in Thoothukudi? In 2008, the Department of Community Medicine, Tirunelveli Medical College submitted a report titled “Health Status and Epidemiological Study Around 5 km Radius of Sterlite Industries (India) Limited, Thoothukudi.” The study covered a population of 80,725 people and compared the health status in villages around Sterlite with the average health status prevailing in the state and two other locations that did not have any major industries. The health report is a well-kept secret because of what it found. At the time of the study (2006 and 2007), Sterlite had been operating at a far lower production capacity of between 70,000 and 170,000 tonnes of copper anode per annum (tpa). It was only in 2005 that it was permitted to manufacture at an expanded capacity of 300,000 tpa. "Since 2007, Sterlite has been operating a 400,000 tpa smelter, nearly six times larger than what it began with in 1996." 1. Iron content in the groundwater in Kumareddiapuram and Therku Veerapandiapuram, the site of the ongoing protests, were 17 and 20 times higher than permissible levels prescribed by the Bureau of Indian Standards for drinking water. Chronic exposure to iron through drinking water could result in chronic fatigue, joint pain, and abdominal pain. 2. At 13.9%, respiratory diseases were significantly more prevalent in the areas surrounding the factory than in areas without industry and this was much higher compared to the state average. The incidence of asthmatic bronchitis is 2.8%, more than double the state average of 1.29%. Bronchitis is an inflammation of the airways lining caused by long-term exposure to environmental irritants such as tobacco smoke, dust or chemicals. Asthma is a condition where the muscles around the airways get tight resulting in the narrowing of the airways. Asthmatic bronchitis is a condition where asthma and bronchitis occur together. 3. The study also found that there were more people suffering from Ear, Nose, Throat (ENT) disorders near the factory. Among the ENT diseases, pharyngitis and sinusitis were very high. “Climatic conditions and atmospheric pollution could be the cause for the prevalence of ENT morbidity,” the report concluded. 4. Myalgia, or general body pain, was another widely reported symptom in the study area closer to the factory. 5. “Women in the [study] area had more menstrual disorders, like menorrhagiae and dysmenorrhagiae. . .it needs an in-depth study,” the report stated. 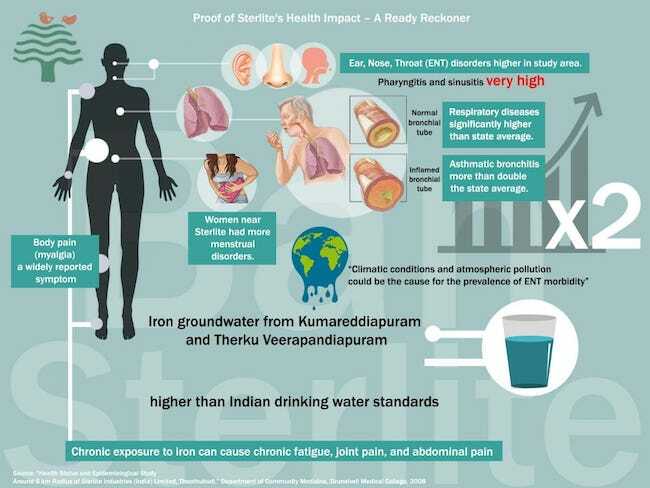 This study has disturbing findings, since the high incidence of respiratory diseases found in 2007 was at a time when Sterlite was running at less than half its current production levels. Respiratory diseases are an indicator of air pollution which has been identified as the “world's largest single environmental health risk” by the World Health Organisation. WHO reports that in 2012, around 7 million people died – one in eight global deaths – as a result of air pollution exposure. Nityanand is a Chennai-based writer and social activist who has been part of the campaign to shut-down Sterlite since 2003. Views expressed are his own.